As expected it is dominated by credit cards (54%) and autos (29%). 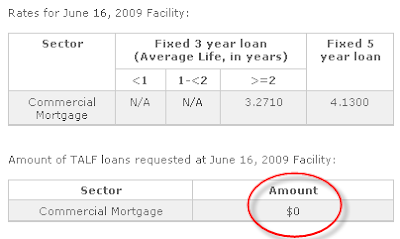 CMBS based loans are strangely missing. Is it too early? Premium Finance ABS program was announced around the same time as the CMBS program and some Premium Finance bonds have already been financed with TALF. Premium Finance loans are used to distribute corporate insurance (such as hazard insurance) premium payments over a period of time rather than in one shot. For CMBS with average lives beyond five years, collateral haircuts will increase by one percentage point for each additional year of average life beyond five years. The financing rate is LIBOR Swap Rate + 100bp. 15% down, the government funds the rest. You would think people would be lining up to do this. What gives? Is it possible that even with all the nice leverage the Fed is providing, there are not many takers? This is not a typical 3-year auto deal that is clean and predictable. 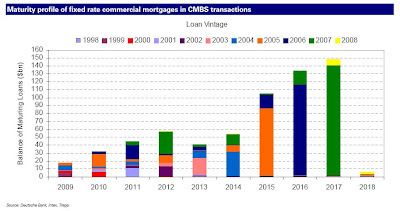 CMBS has some serious refinancing risk (chee chart of maturities below) and TALF may not be there when the time comes to roll. Leverage doesn't help when you don't believe in the asset. Reuters is quoting Citi saying the delay is due to complexity. "Nobody was expecting any deals to be ready in June," said Darrell Wheeler, head of securitized asset strategy at Citigroup Global Market. He said they would come in July at the earliest, and more likely August or September due to the complexity of the origination and structuring process compared with other assets eligible for a similar Fed program. We'll track the situation closely.